The pieces shown are in our popular Lake Superior White Caps Design. These pieces are also available in our other colors: Georgian Bay, Iron Mountain, and Copper Harbor. Click here to see all the colors and their stories. Lake Superior White Caps design. These pieces come in all color combinations. 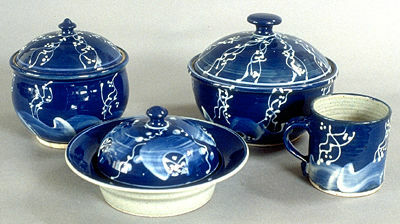 A collection of serving pieces in the Lake Superior White Caps Design. From left to right: Very Small casserole, one quart capacity, 8" tall and 8" wide, $42, (C1); Butter Dish, 9" wide and 4' tall, $48, (B10); Small Casserole, 1" quart, 9" wide. 8" tall, $60, (C2); Regular Straight Sided Mug, 12-14 oz., $22, (M2 ). All of these stoneware items can go into the dishwasher. The casseroles can go into a conventional oven. 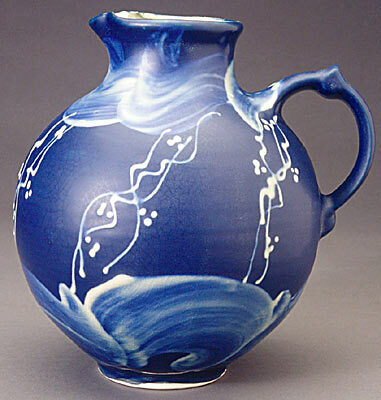 Large pitcher in Lake Superior White Caps Design. This generous pitcher is only 9" tall and yet holds over 3 quarts. It is practical for large floral displays as well as serving hot or cold beverages to a large group. The grip ring in the handle allows for a sure grip. This porcelain piece is dishwasher safe. The opening at the top is small enough to control a good display and just large enough to get your hand inside for cleaning. Its catalog number is P2 and it sells for $70. It is also available in Georgian Bay, Iron Mountain, and Copper Harbor. 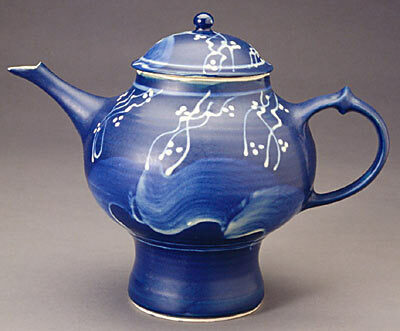 Large Porcelain Teapot in Lake Superior White Caps Design. 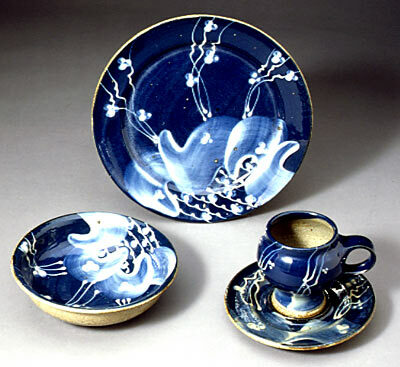 This piece could be used to serve Tea, Coffee or Hot Chocolate. It stands 9" tall and holds 1 quarts. The grip ring allows for a sure grip and easy pouring. It is dishwasher safe. The catalog number is T2 and its price is $95. This serving piece goes well with the pedestal mug, (M3), at $18. It is also available in Copper Harbor, Iron Mountain and Georgian Bay.